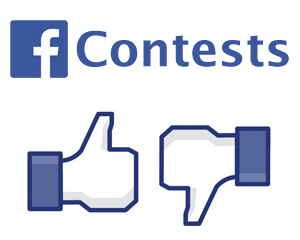 Facebook changed its contest rules making a lot of marketers and small business owners very happy. No longer would you have to use a third-party app and pay to run the contest, you can now just post a contest on your business page timeline and ask people to like the post or comment for a chance to win…a set of steak knives…or whatever. Sure, this type of contest is great for a quick hitter where you just want to give away something small and help boost your visibility among your current fans. But, it does nothing to help you gain more fans that might like your products or help you build up your e-mail database to convert those Facebook fans into actual customers. It just helps your Edgerank score and makes people think you care about them. And, that’s fine…I have no problem with this. But, shouldn’t you want fans that are going to stay with your brand and want to see more of what you offer on a daily, weekly, monthly, yearly basis? Using a third-party app to run your contests allows for one of the most important parts of marketing – getting potential customer e-mail addresses so you can guide them to your website for specials, offers, information or purchases and, even better, come into your store (if you have a brick and mortar). Social media allows for businesses to talk to their customers/clients and hold conversations. But, getting them to purchase from you and become “brand evangelists” requires something more – showing that you care with valuable content on a daily basis. A social media contest offers initial incentive…but how do you keep talking to those fans when Facebook only shows your fans 10% to 20% of your content? I am excited about the new rules. It makes it easier for me to hold some small contests that might last a day or two and not fear the wrath of Mark Zuckerberg. But, let’s face it, brands were holding illegal contests all these years and Facebook RARELY did anything about it while those of who followed the rules actually spent money to do so. This was just Facebook’s way of evening the playing field because they couldn’t monitor all the illegal marketing happening in “their space”. And, while I am excited, I will still use a third-party app to run BIGGER contests for our clients. The people who take part in those will, more than likely, stick with the brands once they see what our clients have to offer all the time.